The Spiral Garden – tagged "crayons"
Since beginning our work at Spiral Garden, we have undertaken a great deal of research into the products we stock, wanting to bring our customers the best quality range of ethical and environmentally friendly products we can find. We've sought out the products we'd love to use most in our own home. We've asked why our popular products are so popular and what our customers love about them best. We've also looked into their manufacturing, shipping process and ingredients lists, where possible. It's not always an easy task to find the nitty gritty on certain products. And many we take for granted as being "safe", "non-toxic" and "harmless", when a little further research suggests perhaps they are not 100% so... It's quite an eye-opening process and as such, certain products may not be re-stocked as we find they do not meet our expectations. Or, we'll continue to stock them but let you know their credentials as much as we can. With all that in mind, to begin with, our attention turned to art supplies in Spiral Garden and today, I'm going to tell you all about our range of crayons and the process we've undertaken to understand them and create the range we have. The shape of the Stockmar Block Crayons is fantastic for small hands to hold and begin drawing and experimenting with colour. Our children held them and enjoyed making their first marks on paper at only nine months! 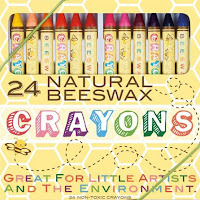 If you want a great to use, artist quality beeswax crayon that will last forever, these fit that bill. Something our research has turned up is that, while Stockmar crayons do contain pure beeswax, they also contain a minimum of 10% paraffin (we've heard it may be even higher than this), among other chemicals which are used to help the colours stay fast and the crayons non-sticky and solid for years. Their pigments are often reported as "food safe" and "natural" when in actual fact they are pigments safe for use in food packaging, not food itself and some pigments are organic, while others are inorganic. Paraffin in crayons, whilst being non-toxic and safe for human use, is made from petroleum, which in itself is toxic and not something I'm super comfortable with my toddlers ingesting and is one reason we've avoided buying commercial brands of parrafin crayons. But its only a little alarming, when I consider many of the other things our toddlers have ingested... Overall, we love these crayons. Stockmar is an ethical company as far as we can tell and while not all product information is displayed transparently, basic information is generally accessible. They are made in Germany and shipped to a distributor in Australia who ships them to our supplier in Melbourne, who ships them to us... there's a fair bit of handling involved. After assessing all this information about Stockmar Crayons, we needed to understand the crayon making process. We procured a block of local beeswax and made our own and learnt that we are not so great at making attractive crayons ourselves! They were patchy and a bit lumpy and we'd need LOTS of experimenting to refine them, but they worked, so that's the main thing! But, we did understand more about the process, the chemicals and how they work to get the colour onto the paper. Next we found the most natural crayon we could. 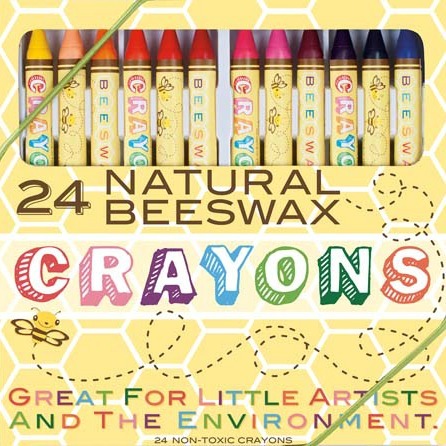 Busy Bee Beeswax Crayons are made with Beeswax, natural pigments and clays. That's it. They are sticky to touch, so the wrapper is handy. We're thinking they may break a little more easily than Stockmar crayons, although this hasn't happened yet. Their colours are very natural looking. So natural that they lend themselves very well to drawing nature and in particular, the Australian landscape. The colours remind us of Tasmania. These crayons are not what I would describe as artist quality. They are more transparent and they don't have the same glide as Stockmar crayons which we understand from our crayon-making experiments... But they are still beautiful to use and in the hands of an artist, any tool can create a thing of beauty. They smell like honey! And they come direct from the hive, being made in the US by a family company with natural parenting values akin to our own. These crayons are triangular, which is a great ergonomic design for owlets who are learning to write. They also come in a selection of 24 colours - the latest we stock. This is handy for owlets who want access to more realistic colours for whatever they are drawing, and more choice in general. They contain beeswax, and are non-toxic, although we're sure they contain some paraffin and non-organic pigments if that is something that bothers you. Their packaging, although reusable, contains plastic, which is something we avoid if possible. In this case, it ors help to secure and hold the crayon selection well and is sturdy enough to last, so we're happy to accept it. These are a bright, vivid crayon and very easy to hold and use. Perfect if you need access to a big range of colours. Looking at our crayon range so far and Spiral Garden's historically most popular products, we decided to reintroduce a vegan option. And we are thrilled with Crayon Rocks. They are bright, great quality, fun to use... They look like jelly beans! They come in a gorgeous red velvet or muslin pouch which adds a little magic and is super transportable - perfect when we go outside to draw and can throw them in a bag or basket. 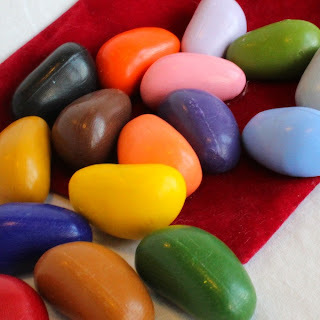 Crayon Rocks are made from soy wax, and a mix of other waxes including carnauba wax, mineral pigments and limestone. They are kosher too. Crayon Rocks are made ethically, by a small company in the US. They work fantastically for little growing hands and have been recommended by occupational therapists for helping to develop children's tripod grip, ready for pencils and pens as their skills develop. They are best used with supervision and are not recommended for children under 3yrs because they are a choking hazard, although our toddler has been ok with them as she's moved past popping things in her mouth. We just love that they are so special and fun, and offer something different for our art supply cupboard. Late last year, we believe we found the crayon we've been looking for all these years. 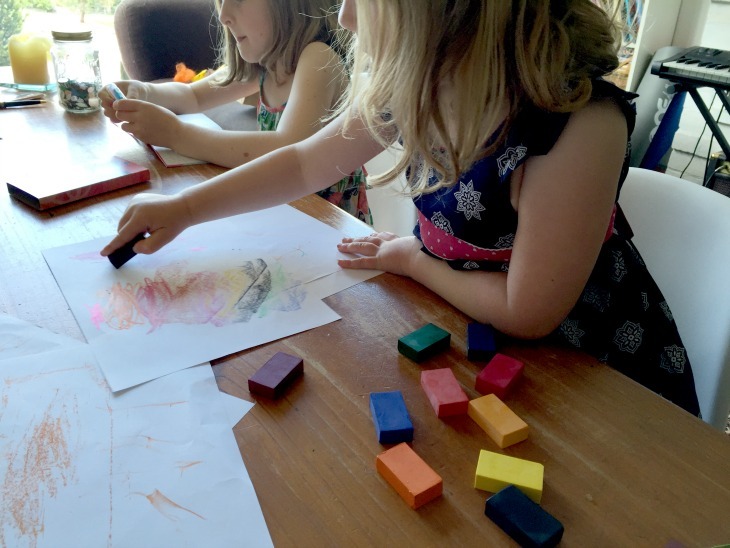 Realising how beautiful Stockmar Crayons are to use, but wanting a more natural alternative, a family in the US set about making some organic beeswax crayons. 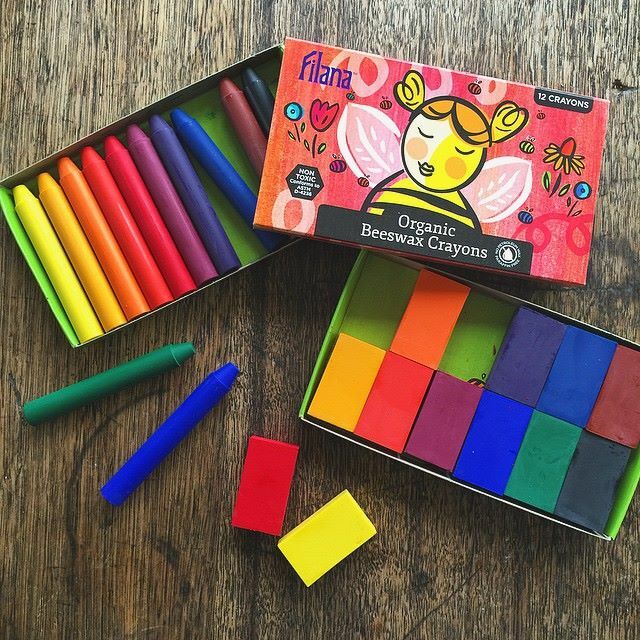 Filana Organic Beeswax Crayons are beeswax and soy based. 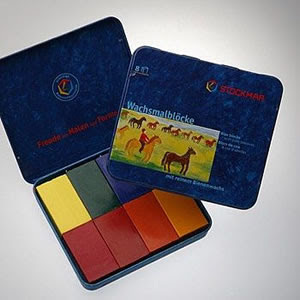 Filana's makers based them on Goethe's colour wheel and created colours used in many Waldorf Steiner schools for crayon drawing. Like Stockmar, these come in a block or stick form. They are robust and the colours are vivid. But what's amazing about these crayons is that they've taken the best bits about all our favourite crayons and created something we find even better! We were actually pretty surprised the first time we used them. The colour and pigment of Stockmar's crayons combines with the smooth, glide-ability of Crayon Rocks. And they're organic and made by hand by a family company! They also ship directly to us, keeping handling down and costs low. And their packaging is compostable - a super important factor for us. We really can't find flaw with them and of all the crayons in our crayon bowl, these are the ones that get the most use nowadays. An instant classic and a lot of fun to work with. You can see them in action in a video review of them, by Sarah Baldwin, over here. We leave crayons in a space where the Owlets can easily reach them. 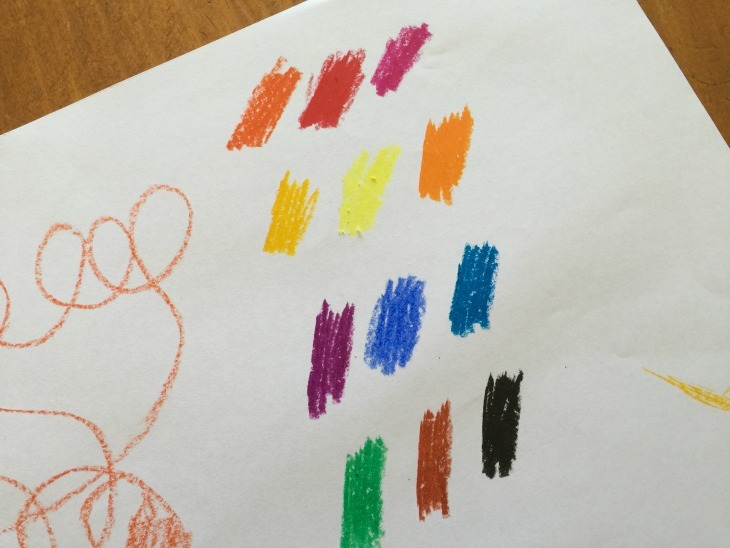 Near sketch books or paper, they use them readily as they play and make art learn about colour. They pick and choose the right crayon for the job, as do we - crayons are fun to work with! Whether used on their sides, or as finer points for linework, we all enjoy using them to put colour on a page, quickly and expressively. How do you use crayons in your nest? You can find our complete range of crayons and drawing materials here. This week, you could win TWO sets of our Filana crayons - one block and one stick 12pk. Just sign up to our Spiral Garden newsletter to be in the running! Go here to sign up! This post was originally published on our personal blog, Owlet.